In medicine, a chest X-ray (CXR), is a picture(projection radiograph) of the chest used to diagnose conditions affecting the chest, its contents, and nearby structures. It is created by a small outputs of radiation passing through a Patient’s body. It is then recorded on film. Chest radiographs are among the most common films taken, being diagnostic of many conditions. How long before the results are back? Chest X-rays are invaluable diagnostic tools in Intensive Care and they are used to diagnose many conditions involving the chest wall, bones of the thorax, and structures contained within the thoracic cavity including the lungs, heart, and great vessels. Pneumonia and congestive Heart Failure are very commonly diagnosed by chest x-ray. A chest x-ray will also be performed after procedures such as insertion of a central line (CVC, Central Venous Lines) or a Breathing Tube or Endotracheal Tube, an intercostal catheter (ICC) or insertion of Nasogastric Tubes. Intensive care Patients are having their chest x-ray taken in their bed. The X-ray technician uses a portable machine and takes the x-ray with the ICU nurse supervising. The patient is sat as upright as possible and the x-ray plate is placed behind them. Some Patients are too unstable to sit upright, the chest x-ray then is taken whilst the Patient is lying flat or in a supine position. If Patients are awake they will be asked to hold their breath. 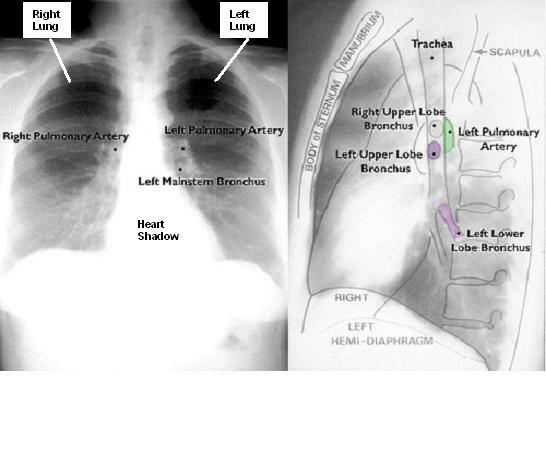 When taking a CXR for the ventilated Patient the technician will take the x-ray, timing with the ventilator. As there is only a small amount of radiation used, exposure to radiation in minimal. Your loved one may be uncomfortable for a few minutes, whilst the radiographer and the nurse put your loved one in the ‘right’ chest x-ray position. If your loved one is going to have a large number of x-rays or is pregnant small lead barriers will be used to protect your loved one. You may hear the X-ray technician say “x-ray”. This is to alert the staff in ICU that an x ray is being taken. Usually chest x-ray results are back within minutes. Most chest x-rays now can be seen online within minutes and the doctor in charge of your loved one will have a look. Furthermore, a formal report of a radiologist will be made available within 12-24 hours.